Background: Lovingly crafted by Piers Conway & Laura Cowling, Stone Masons based in Somerset, and HUGE Stranglers Fans since 1978!! Logistics: Buyer must pay delivery costs, according to location. (Rough Guide, delivery by courier to the UK: £150). Collection is an option. To be discussed in full once we have a firm order. 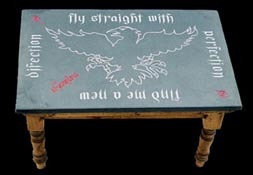 Hand-Chiseled lettering reads: "Fly straight with perfection find me a new direction." In the centre is carved The Raven.